Whether or not you believe that B. Franklin actually uttered those words, we can probably all agree on one thing: hops=happiness. So in honor of ales, lagers, pilsners, porters and more, we put back a few and compiled this beer-themed bucket list of must-visit breweries and tours in Durham. Because the best pilgrimages are to places with pints, naturally. Come along with Beltline Brew Tours for private and group tours of Durham breweries, which include stops at Bull City Burger and Brewery, Ponysaurus, Fullsteam and an inside look at the brewing process. Trolley Pub is a BYOB, pedal-powered, eco-friendly, pub-crawling trolley for up to 14 people at a time. The Trolley Pub is powered by YOU and your fellow pedalers, with an electric assist motor for the hills. You can choose 2-3 stops during your tour- at breweries, pubs and restaurants. The Beer: If you want something a little different, head to Barrel Culture. It’s in the colors of the beer. It’s in the taste. It’s in the beer slushies. Yep, you read that right. They make 100% Oak fermented, rustic fruit driven, wild artisanal style ales that marry local terroir and aggressive flavor profiles. We think it’s pretty great. The Beer: Bull City Brewery uses just malt, hops, yeast and water to craft our beer, leaving out adjuncts and additives. Over an 18-month cycle, they brew about 60 different true-to-style ales and lagers. They always keep it interesting and mix it up according to the season. Tours and Tastings: Tours are available most Saturdays. Bull Durham is the home brewery of the Durham Bulls. As the first brewery in the country owned by a Minor League team, Bull Durham Beer Co. figured, what better place to brew than right next to the concession stands selling their beers? 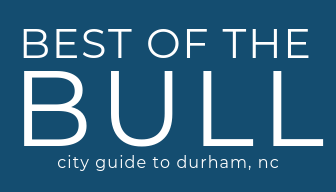 Durty Bull has a 6,000-square-foot, 15-barrel production brewery and tasting room in Downtown Durham. The Beer: They age many of the beers in barrels and feature an extensive sour beer program. Beers include an IPA, Porter, Lager, and Sour Blends. Tours and Tastings: Get a behind the scenes tour, as well as a flight of 4 4-oz tasters and one full pour! Tours are held on the 1st and 3rd Friday of every month and kick off at 7 pm. We love Fullsteam’s mission of buying local to brew local. They partner with other local businesses and sourcing their ingredients from local farmers. We think it makes all the difference. They always have great events like yoga, markets, trivia, and more. Tours and Tastings: Saturdays at 2:30pm. The $10/person tour lasts an hour and includes a selection of four rotating beer samples. You’ll also receive 20% off all merchandise and to-go beers (cans, bottles, crowlers, growlers). Ponysaurus describes themselves like this: “the beer beer would drink if beer could drink beer.” If you’re anything like me, their Plum Saison and Don’t Be Mean to People will win you over. We love their sweet outdoor space, awesome events, and yeah, the beer. Tastings and Tours: Satursdays at 1:00pm, $10 per person. Includes a beer tasting, free jokes, and 10% off all merchandise purchased on the day of your tour. Tours last approximately 30-45 minutes. Starpoint Brewing was founded in 2012 by Beth Boylan and Tim Harper as a labor of love for hoppy beers. In 2016, they partnered with Beer Study to create a space that served as their taproom and collaboration brewing space. Held in early October every year at the Durham Bulls Park, experience some of the finest beers and ciders around all in one place! Access into the Art of Beer Experience for beer ingredient samplings, pairings, educational seminars, a mini commercial brewery and more!